Anxiety can characterize your first duck hunting experience. A roller coaster of emotions accompanied by questions on Duck Hunting for Beginners will come to your mind. Questions ranging from “Can I handle killing another creature?”, How do I go about getting the right duck hunting kit?’, “Do you need permission to go duck hunting as a beginner?”, “What type of firearms do I need?”, “Is it even legal to hunt ducks?” and so much more. These lines of questions are typical for beginners. It will interest you to know that duck hunting is very exciting and different from other types of hunting. If you want to have a worthwhile experience then Duck Hunting for Beginners’ will come in as a handy guide. Duck Hunting for Beginners reality check. Step 1: Duck Hunting for Beginners Reality Check. Duck hunting is very interesting and memorable experience for anyone that’s got the guts to kill another creature. You may have an interest in duck hunting but in reality, you may not have the stomach for it. So before you even kick start your duck hunting experience then you must get an affirmative to the question; Can I actually kill another creature? The next big step is to make sure you set out hunting ducks legally. Duck hunting is highly regulated and breaches come with very high fines. In order to avoid paying heavily for going against hunting laws, you must enroll and complete your hunting education. Apply and get your license and permits before you set out, know the rules, regulations as well as limitations. Now that you’ve answered the question to step 1, having the right camouflage is your next step to your Duck Hunting for Beginners’ experience. Your camouflage is largely dependent on where you will be hunting. Select a camouflage that suits where you’ll be hunting. If you are hunting in the woods, it will be best to choose a print that is leafy and barks like. A grassy camouflage will be ideal for a grassy area. Remember that when duck hunting you should prepare to get wet as ducks like water, so it’s best you layer more clothing under your camouflage. As far as waders go, I prefer chest waders because this will keep you dry if you want to sit. A 12 – gauge shot-gun will do just fine for your Duck Hunting for Beginners’ experience. I will also recommend semi-automatic shot-gun, one with a pump-action. There are laws guiding hunting, it is against the law to use a toxic emitting shot-gun. Now you don’t want to go against the law. I recommend shooting using number two shot, It is required in knocking down bigger birds. You need to gain a little experience in handling shot-guns which brings us to the next step. The fifth step will be to hunt with experience. Initially, I recommend you hunt with a friend or close relative who hunts responsibly and legally. Knowledge of shotguns and layout is very important in Duck Hunting for Beginners. More knowledge comes with experience in duck hunting. You will gain knowledge from experienced duck hunters who have a few tricks up their sleeves. There are numerous duck hunting places grounds. You will need to read up on the internet where to hunt. The most important thing is to hunt where you are allowed to hunt. There is no rule that says you must stick to one particular spot. Do not hesitate to try out new hunting grounds. Bear in mind that ducks are not likely to come back to the same place where they’ve experienced the fright of their lives evading bullets. So carry out a little background check before heading out to new hunting grounds. This knowledge will come in handy because some species of ducks are not available to hunt in some seasons. Duck hunting is highly regulated. Carrying out a thorough check to see which species of duck is available for hunting is very important. This step will not take you long to figure out. You do not want to be on the wrong side of the law. It gets more interesting and fun. Perfecting your duck call can be a humbling experience for beginners especially if it brings them in. Alas! This may not always the case for beginners. Do not fret when the ducks scamper out of reach because of your warning calls. Practice brings perfection. Keep practicing; there are some helpful coaching videos on YouTube that will help you at this stage. Pay attention to the pitch in your calls, when to call out loudly and when to call out softly. Before long you will master the art and join the long list of duck callers. Unlike other kinds of hunting, duck hunting takes place at social events and appears to be a favorite past time for some people. On the other hand, some families see it as a tradition that must be passed on. Whatever the case, I advise you enjoy yourself as much as possible. Whether you are hunting with your dog, a friend or family, remember to have fun. Ensure you have the right hunting gear, gun license, and hunting license or permit. Don’t beat yourself so hard after some failed attempts at the beginning, most professionals started just like you. A step at a time and you will master the duck hunting sport. 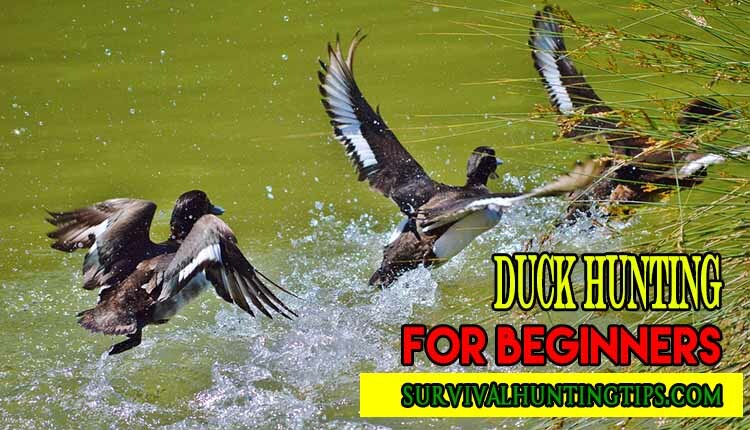 I hope the steps in Duck Hunting for Beginners’ provided you with simple to follow through steps of duck hunting. You are welcome to drop your comments and questions in the comment box below.